“Work on the building the new instead of fighting the old. Build the new and the old falls away.” This is one of my ways to treat ptsd without medication. This is true. We can’t fix a problem by being and acting at the same energy level. We must rise above and look at it from a perspective of higher vibration. 1) On a piece of paper, create three columns with a line. 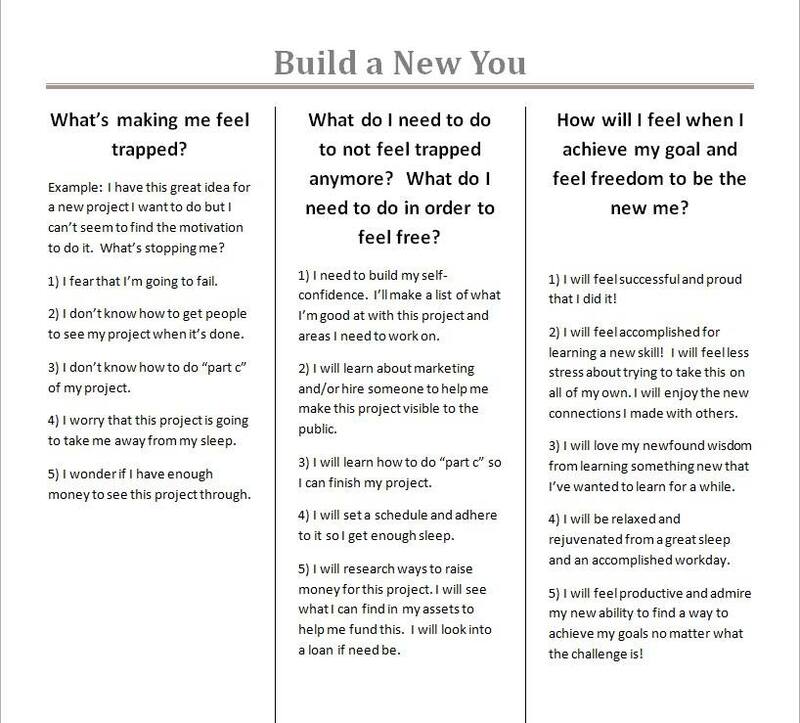 2) On the left side, write down all the things that are making you feel trapped in your current struggle, or a goal you can’t seem to reach. It could be physical, mental, emotional, spiritual, or something in your environment like social connections. Write down all the stuff that makes you feel unable to take action. 3) In the middle column, across from each item list, write down what you need to work on in order to remove the block from the left list. For example, “I need to work on my self-confidence. I need to find a marketing specialist to help me market my project. Write down all the action steps you need to take to build the new. 4) On the right column, write down the benefits you’ll receive when you achieve your goal and build the new. Write down the thoughts you will have, the feelings you’ll have, the physical outcome you’ll achieve, and anything else that makes you feel free instead of trapped. Write down everything that will make you feel free. When your done this exercise, start doing the items in the middle column with the feeling of the right column. The combination of your physical action and your emotional connection will propel you forward. I understand dealing with ptsd, it’s really hard. If you can do it once, you can do it again. It takes practice. If you falter, just try again next time. Once you’ve built the new, the old will fall away.